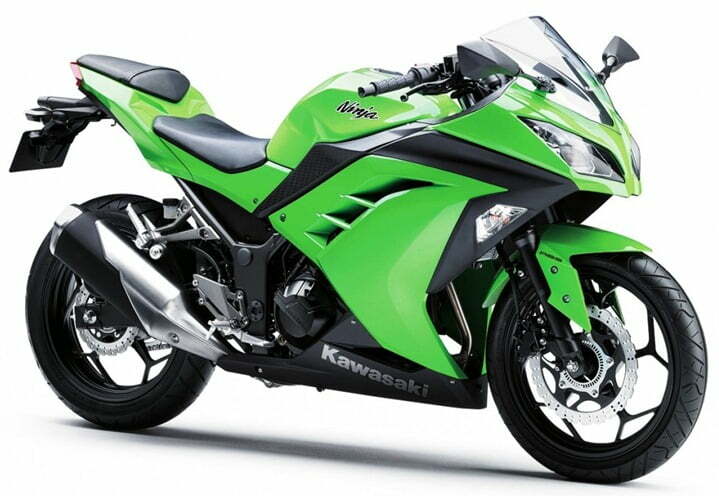 Bajaj recently introduced Kawasaki’s latest superbike named Kawasaki Ninja 300 in India. The bike was officially launched by Mr. Rajeev Bajaj along with a press conference. The bike sports a 296 cc power source that generates power worth 39 PS against a peak torque of 27 Nm. India has been kept away from the ABS option that the maker had offered in U.S. The size of the front tire of the bike measures at 110/70 -17 while the rear tire size stands at 140/70-17. On a whole, the bike dimensions measure 79.3 X 43.7 X 28.1 inches. The total weight of the bike weights up to 172 kilograms. Apart from this, an advanced Digital Fuel Injection system has been incorporated in this bike. This system utilizes 32mm throttle bodies that improves the fuel economy of the bike and ensure cleaner emissions. A F.C.C. clutch along with slipper and assist function has been provided, this helps in handling more power and makes clutch modulation smoother. It also lessens the effect of reverse torque that ultimately reduces hopping of wheel while downshifting. The maker has provided the bike with a robust and aggressive body design. The engine of the bike mates with a six speed transmission that features the latest roller-type shift drum. The bike has been made available with two color options Pearl Stardust and Lime Green. In looks, the Ninja 300 looks far better than the 250R. But the two-wheeler stands below and above the upcoming Duke 390 in terms of power and weight respectively. Till date, Bajaj has managed to trade more than 3, 000 units of Ninja that includes version of this bike – 250R and 650R. So, it is expected that the fan following of Ninja will increase with the introduction of this new model. The price of this new model has been quoted at Rs.3.50 lakhs. During the press conference, when a query was made for Duke 390, Mr. Bajaj softly answered that the conference had been organized for Kawasaki and not KTM.